People talking – exactly NOT what we’ve come to see. In a small Mexican town, a square-jawed American cattle rancher with a suitably steel-chested name (Guy Madison as Jimmy) puts the moves on Sarita (Patricia Medina), the whitest Mexican girl in town, who happens to be betrothed to powerful Mexican cattle owner Enrique (Eduardo Noriega – not the modern Spanish dreamboat, the old Mexican actor). Love triangle ensues, with Sarita more than willing to have secret meetings with Jimmy, or slide down his body delicious as he helps her off a horse, then complaining that her boyfriend is going to kill him. Poor Mexican dude never stood a chance though, not with this American production making the leading man look more square-jawed and steel-chested in every shot. And with all the cattle disappearing in the swamp, fistfights between the two men, cattle deals, cattle stampedes, Sarita’s wedding (for which she does a Runaway Bride – to be at Jimmy’s side! ), and stereotypical Mexican comic relief from Pancho and Panchito (a drunk father and his young son), we almost forget there’s a “beast” lurking up in that there Hollow Mountain. Seriously, besides the cattle going missing in the swamp – for which the answer might be quicksand – there is no hint, no whiff, no intimation that there is something totally outrageous waiting to spring on the movie in prehistoric bombast. With only a few minutes runtime left, a stop-motion tyrannosaur comes roaring out of the swamp – animation NOT by Willis O’Brien or Ray Harryhausen, but definitely in their wheelhouse – and shockingly eats the comic relief (who saw that coming?! ), then conveniently eats the Mexican fiancé (we ALL saw that coming! ), and is killed single-handedly by the American Muscle (that too! ), while armed ranch hands on horseback look on from somewhere offscreen and do nothing. 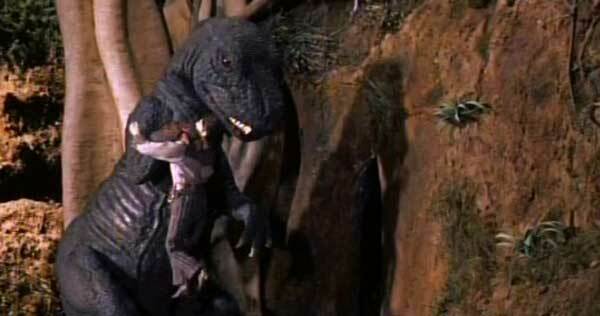 The only other Mexican Dinosaur Western I can think of is 1969’s KING KONG-inspired THE VALLEY OF GWANGI. If nothing else, 1956’s BEAST OF HOLLOW MOUNTAIN can claim a unique pedigree in this tiniest of film genres. Directors: Edward Nassour, Ismael Rodriguez. Writers: Robert Hill, Jack DeWitt, Willis H. O’Brien. Starring: Guy Madison, Patricia Medina, Carlos Rivas, Mario Navarro, Pascual García Peña, Eduardo Noriega, Julio Villarreal.